Announcing Special Guests, New & Improved Festival Layout & more! Announcing Special Guests, New and Improved Festival Layout, and Garcia’s Forest Lineup & Activities! Just Announced: Special Guests to Join LOCKN’ Lineup! MUSIC ANNOUNCEMENT ALERT! We all have been eagerly awaiting.. 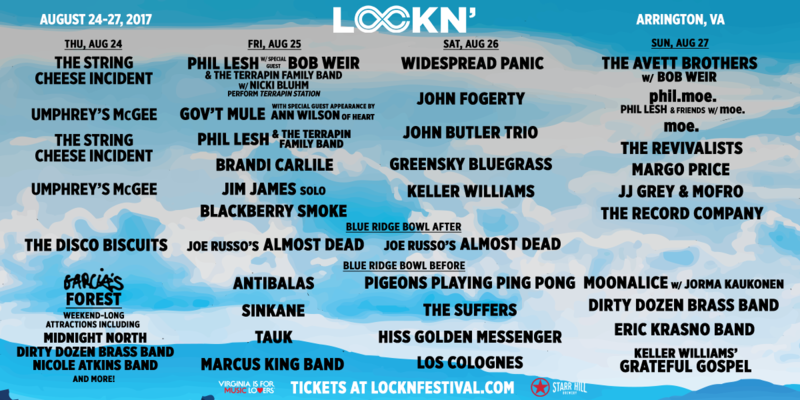 Drum roll please… Additional artists and collaborations set to take place at this year’s LOCKN’! Collaborations include The Avett Brothers with Bob Weir, Gov’t Mule with special guest Ann Wilson of Heart, Phil Lesh w/ Bob Weir & The Terrapin Family Band w/ Nicki Bluhm, and Moonalice with special guest Jorma Kaukonen! Putting on a music festival is challenging feat. It requires significant resources and the dedication of a large group of hard-working people, year-round. And it also requires the ability to adapt, to look honestly at what works, and what can and should change to keep improving the overall experience of our patrons. At Lockn’, we’re coming up on our fifth year of the festival, and could not be prouder of how far we’ve come. We’ve built a family: we’ve celebrated countless engagements, weddings, anniversaries, tributes, and once-in-a-lifetime moments with you. Over the last four years, we’ve learned a lot about Lockn’, and about our beautiful location that we are proud to call home: Arrington, Virginia, nestled at the foot of the Blue Ridge Mountains. If you’ve been, you know: it’s stunning. And we’ve done a lot of listening, too. Each day, we read and listen to your emails, your comments, your tweets, and we learn about what Lockn’ means to you, what you love, and what you would like to see change. Making your experience of Lockn’ something special is our driving motivation. We appreciate your feedback, and we want to let you know that we have heard you, and use your ideas to help us continue to adapt. Each year we’ve made changes to Lockn’: we’ve gone from two stages to one turntable stage that seamlessly connects one band’s set into another; we’ve introduced Garcia’s Forest, a new home for Dead lovers to revel and groove, and we’ve started opening our gates a day early in order to load in RVs, reducing traffic coming in on the first day of the festival; plus countless more changes, both noticeable and subtle. 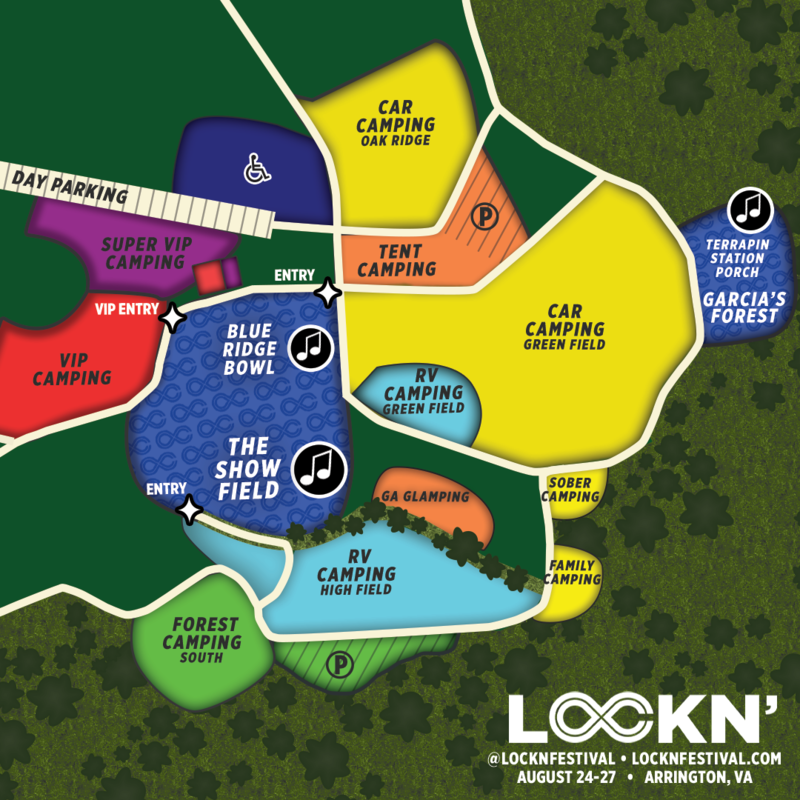 This year, we will be making some more changes to Lockn’, based on feedback that we’ve received from you. We’ve heard that for some, camping can be too far from the main stage, making it difficult to trek back and forth throughout the weekend. We’ve heard that in last year’s heat, there needed to be more shade and more water. We’ve heard that you want more of what Lockn’ set out to do: a weekend of non-stop music, with one set flowing into another, where you don’t have to miss a thing. We’ve heard you loud and clear on these things, and we are excited about how we plan to address them. In 2014, after our first year of Lockn’, we purchased the land that we call Infinity Downs Farm, which is directly adjacent to Oak Ridge Farm (where we have the horse track). You know Infinity Downs Farm already: it is home to our Blue Ridge Bowl stage. Since 2014, we have spent significant time and resources investing in infrastructure to this property, building out the land so it is well equipped to hold large-scale events. After all the work we’ve done on our land, we’ve accelerated our plans by a few years, and have started to produce a series of large-scale events on the property. The venue of Infinity Downs Farm itself is beautiful, truly a site to behold. This year, we will be expanding Blue Ridge Bowl within Infinity Downs Farm so that it can hold both stages (including the main stage) and more than 20,000 people, with improved sight lines. The venue features two stages with non-stop music all weekend long, along with plenty of food, drinks, shopping and great causes, plus a lineup of acts and activities in Garcia’s Forest nearby. This new centralized concert venue will be significantly closer to all camping, so you don’t have to venture as far to enter the venue. You will find more shade and misting stations to keep cool in case of heat. Dust levels will be reduced by moving off the horse track, and traffic routes will be even more direct and efficient, making entering and exiting the festival even smoother. We are also excited to announce that Garcia’s Forest and The Woods will be combined in 2017 to create a new Garcia’s Forest, which will feature the Terrapin Station Tent, and a schedule of live music of its own. We are excited for these changes, as we believe it will give you, our fans, more of the Lockn’ that you love – and will improve your Lockn’ experience. We thank you for coming on this ride with us, and we look forward to celebrating with you again in August. Meet the New Garcia’s Forest, Featuring Terrapin Station! This year, Garcia’s Forest has been expanded and, among other things, will feature a replica of Terrapin Station. 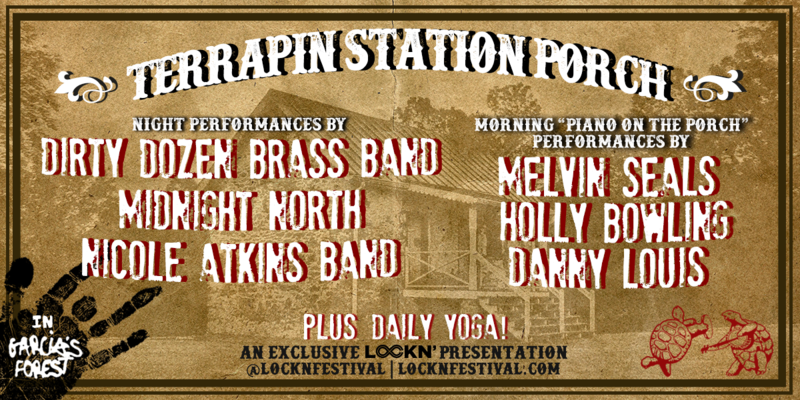 The Porch at Terrapin Station will host unique nightly performances including Dirty Dozen Brass Band, Midnight North, and Nicole Atkins Band. “Piano On The Porch” morning presentations will highlight Melvin Seals, Holly Bowling, Danny Louis, and others. Additionally, Garcia’s Forest will present a range of activities to awaken your spirit including daily yoga and more. To help ease your entry into the Festival Grounds, a limited number of GA RV Camping Pass holders (4-day only) and VIP & Super VIP patrons will be allowed early entry to the campgrounds on Wednesday, August 23, between 4PM and 8PM EDT. Those tickets are available HERE. For those who register for Wednesday early access to the RV High Field campgrounds, please do not plan to arrive before 4PM or after 8PM EDT on Wednesday. After 8PM EDT on Wednesday, access to the campgrounds will be closed until Thursday, August 24 at 6AM EDT. GA RV Camping Pass holders and any VIP or Super VIP ticket holders who do not register for Wednesday early entry will be able to access the RV campgrounds starting 6AM EDT on Thursday. Please note that we have a limited amount of early admission registrations and cannot guarantee early entry to those who do not register in advance. Any vehicles that arrive on Wednesday without pre-registering for early admission are not guaranteed entrance, and are subject to an increased early entry fee of $30. A limited number of food vendors and the on-site general store will be open on Wednesday. There will be no musical programming on Wednesday. There is NO RE-ENTRY for vehicles in the Campgrounds.